The bottom of the glass has our ROCK which creates a natural liquid motion increasing the nosing of aromas. Just fill the included silicone mould to fill line and put in the freezer to make a single solid ice ball that outlasts traditional ice cubes. The included decanter is mouth-blown and features a solid glass stopper that helps to seal in freshness and aroma. Holds up to 1 litre of your favourite spirit. ROLLING: The shape of the glass makes rolling easy without spilling. 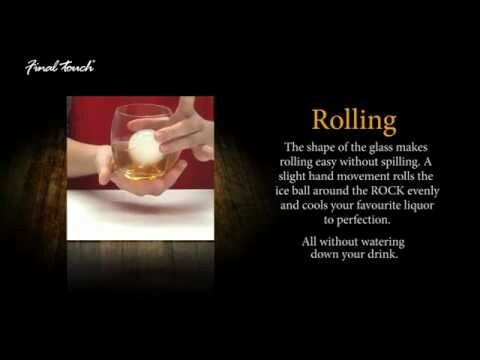 A slight hand movement rolls the ice ball around the ROCK evenly and cools your favourite scotch, whiskey or liquor to perfection. ON THE ROCK: The bottom of the glass has our ROCK which creates a natural liquid motion increasing the nosing of aromas. 2” ICE BALL: Fill the included silicone mould to fill line and put in the freezer to make a single solid ice ball that outlasts traditional ice cubes. GLASS PATTERN: Each On The Rock Glass features a Japanese inspired Yarai pattern that is cut and polished by hand. DECANTER & STOPPER:This mouth-blown decanter features a solid glass stopper that helps to seal in freshness and aroma. Holds up to 1 litre of your favourite spirit.